Welcome to QRD #63. This is our ninth installment in the guitarist interviews, which seems pretty insane. Even more insane is it’s over 150 interviews in the series. How did things get this out of control? Just imagine if everyone I asked had taken part, I’d be at double that! 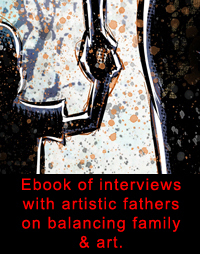 Spread the word about the interviews if you can. 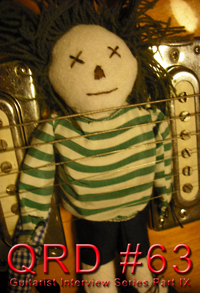 Oh, it's worth noting that the doll shoved under the guitar strings was a gift from a friend/fan several years ago. Thanks Derek! Anyway, as those of you who read QRD or the Silber Blog regularly know, I’m getting to a wrapping up point on things. Issue #64 is going to collect the random odds & ends interviews I have lying around & then I’ll be taking a break on things for a while; so as I suggested last time, sign up for the mailing list if you want to know when we are getting back going again. Thanks for your interest & support, it really means a lot to me that some of you have gotten some entertainment or at least time passed with my work over the years.